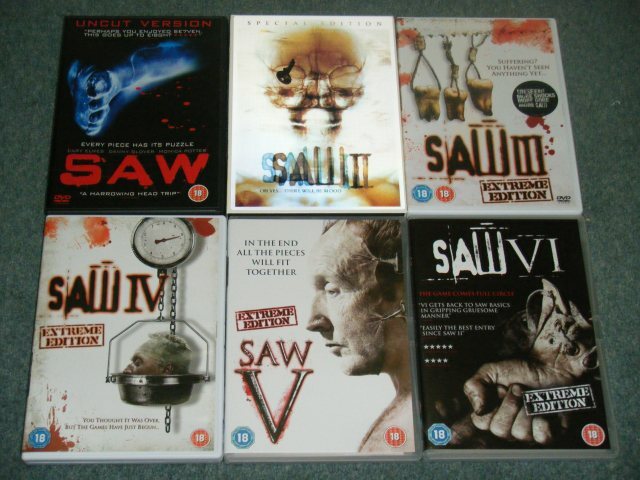 With the newly release Saw 3D (number 7) it reminded me that I didn't own the 6th film so earlier in the week I'd ordered it and now it has arrived! Notice all the "Uncut", "Special", "Extreme" editions? :P The 2nd one has a funky lenticular cover too! The really bad thing though is that I haven't actually seen 4, 5 or 6... (or the new 7/3D). Very few of my friends like Horror movies so the DVDs have been saved up to watch... and I think I'll just have to watch them myself one evening! lol.